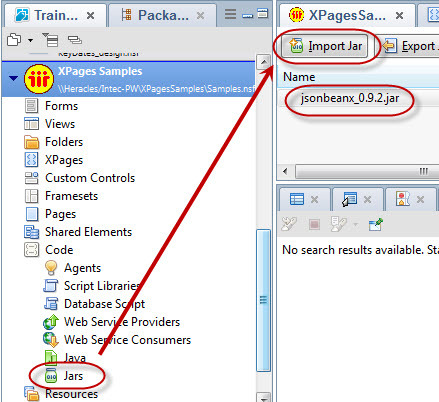 Following on from his session with Kathy Brown at IBM Connect, Julian Robichaux has contributed a lightweight converter between JSON and Java, JsonBeanX. This is just a JAR file that can be imported into an individual NSF and avoids some of the security restrictions of other Java implementations, which would need amendments to the java.policy (or java.pol) file or would need the code adding to an OSGi plugin. Full details on how to implement it are in the JavaDoc documentation. This is designed to convert between JSON and Java objects, but it's an added incentive if needed to use Java instead of SSJS, to minimise the code you need to write and avoid some of the pitfalls you might otherwise need to (re-)address. Outside of XPages, the standard library for translating between Java and JSON is Jackson and Frank van der Linden is working on an OSGi plugin, already on OpenNTF's Stash, to wrap this for those who prefer something a bit meatier and can use OSGi plugins. The second output is the same DavidJson Java object outputted using Frank's plugin. Again, it's just a handful of lines of code. The false parameter passed to the JacksonWrapper tells it to output date/times as date/times rather than converting them to timestamps. There are a variety of options for outputting to files, FileWriters, OutputStreams or just strings (which I use here). And beyond this there is a host of additional functionality from Jackson. Look out for a full release of this project on OpenNTF in the near future or download the source from Stash and get involved (developing, testing, adding feature requests or more). For a walkthrough of the code, here is a YouTube video.